Attachments are added the same way regardless of where you’re adding them. Any number of attachments can be added, and they can be any combination of local files, websites, and resources. At the bottom of a page where you want to add an attachment (i.e. 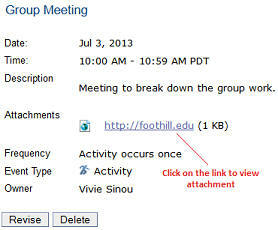 when adding event, announcement or assignment), click the Add Attachments button. Click on the Browse button to find the file to upload. Or, if the item is a link to a web page, fill in the URL. If the item is already added to your files, click on Attach a copy next to the item to attach. If you need to attach more documents, continue until they are all selected. They will show in a list at the top of the page. Note: When uploading or attaching a file, you must include the file’s extension (e.g., .pdf, .doc, .html, or .jpg). If you do not, anyone who attempts to display or download the file will get an error message. Also, try to upload files whose filenames have no spaces and include only alpha-numeric characters. Click on the Finish button at the bottom of the page to complete the attachment adding procedure. Save your changes (button at the bottom of page) to complete the process of posting an item. When a user clicks on the event, announcement, assignment, etc., the attachments are displayed, allowing the viewer to open and view attachments. What happens depends on the type of document the attachment is and how their browser is set up to handle that type of document. If it’s a regular document (word, image, pdf, etc.) the student will have the choice of opening the document (after specifying the application to be used to open it or to save it onto the desktop for later use). The student can also specify if other documents with the same extension (.doc, .pdf, etc.) should be treated the same in the future. If it’s a web URL, that web page will open up in a new window. The process for attaching files in Discussion & PM topics or messages is slightly different. Please see the lesson on Discussions & Private Messages for information on adding attachments to posts.